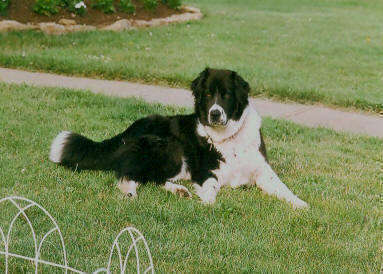 Lyndie is the perfect chore dog, the English Shepherd shadow, always keeping us within sight or hearing. When we call her she comes running to us immediately! She is calm and quiet unless there is something exciting to do! She is an absolute sweetheart, loves all people and is gentle with all children. She is a great watchdog and swims/herds the geese off our ponds. 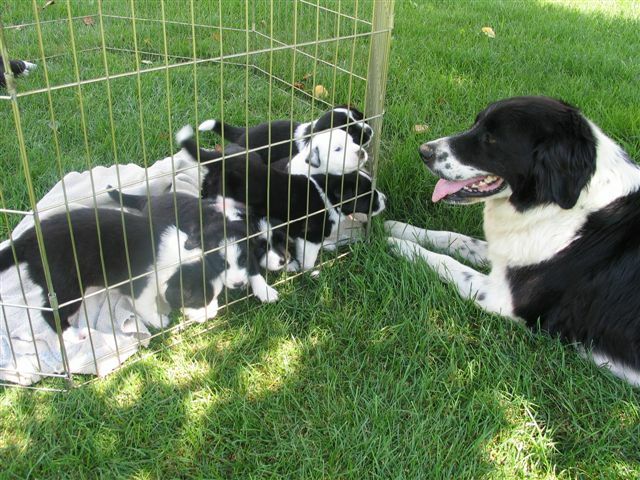 She showed good herding instincts with sheep and is trustworthy around our horses. She is one happy girl and her tail wags all the time! She lives to please and likes to keep things in order. She trained our English Shepherd Bergie not to bark and chase the horses along the fence when I walk them in and out to the pasture and she did this with one reprimand! Lyndie is learning agility now! We are proud to tell you that Lyndie earned her Canine Good Citizen certificate at our Ohio 09 English Shepherd Gathering! Her hips are OFA Good and she is MDR1 normal/normal. She is registered with the International English Shepherd Registry.